From left to right: Thumbs up for Chong Pang cat programme and a cat owner registering himself under the programme (from Minister Shanmugam’s facebook page)It’s been a long time coming – cat owners, we have 2 years to show Singapore and any naysayer that HDB owners with a cat in the family can live harmoniously with other neighbours.The pilot programme is being run in Chong Pang. It was launched in mid-October and under the programme, Chong Pang residents are legally allowed to keep a cat as a pet under the two-year pilot programme. This is a landmark move, and it is up to each of us to prove that this is a sustainable model that should be implemented island-wide. New adopters will go through a rigorous screening process with an adoption house visit and adoption contract to be signed. They can only adopt one cat through CWS or SPCA. The ownership conditions and code of responsible behaviour for cat owners are basic measures that all cat owners should engage in. Existing cat owners with more than one cat need not fret – as long as you meet the ownership conditions including having all your cats microchipped, sterilised by 5 months for females and 6 months for males and ensuring they are kept indoors, amongst others, please contact the Cat Welfare Society at [email protected] to be included in the pilot. There are incentivised rates to book microchipping and sterilisation packages through CWS, but only if booked before 31 Jan 2013. Please contact us if you or anyone you know needs this service. 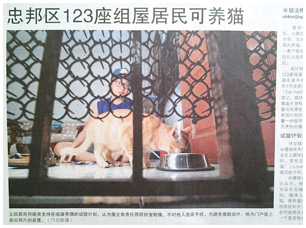 All eyes are on us, those who care for the welfare of cats, be they in the safety and security of homes or on the ground in our community, to ensure that this pilot is a success. If you have time on the weekdays or the weekends between 27 October 2012 and 30 April 2013, please join the Chong Pang outreach team. Even if you don’t, do you know someone living in Chong Pang? Tell them about the pilot programme. Tell them to tell their neighbours. Repost, email, sms, forum chats, let’s make sure everyone knows and understands this programme. We must be the responsible cat owners, the responsible cat feeders, the responsible cat lovers that we want to see others being. It’s up to us. 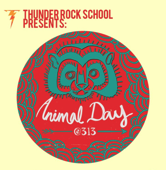 It was double the celebration with Thunder Rock School’s Animal Day at 313 @ Somerset and with the SPCA at East Coast Park. Thunder Rock’s Animal Day drew the same insane crowd as last year and we were selling calendars left, right and centre. We had an awesome kittycat visitor who spent a long time chilling out with us, then he chilled out with some kittens that visited us. The crowd was great, only beaten by the heat which was greater, and we had a whale of a time.CWS was represented by the very talented Mr. Chris Jones of These Brittle Bones and Mr. Charlie Lim who spoke about responsible pet ownership and the importance of sterilisation in preventing unwanted litters. 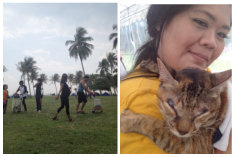 SPCA’s Animal Day was also crazy-busy with pets galore. We met some special owner-cat combinations, like Amina and her adopter Mona. Amina was recently on our Facebook site as one of the featured special cats who was adopted despite having a congenital eye condition that requires frequent surgery. We met a family who had brought their cats out for the first time, and after the initial where-on-earth-are-we, the cats were hanging out with their new friend Teddy, who is a frequent visitor to all our events. Last year he came to the SPCA Animal Day and took photos with a Harley! 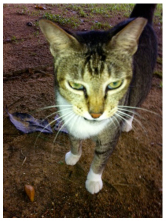 Bobby was rescued from a construction site and had to have one toe removed because of injuries. He’s affectionate, nuzzles against you, and enjoys watching tv as much as you do. Actually, he just likes sitting with you because he’s not had someone love him like you might. 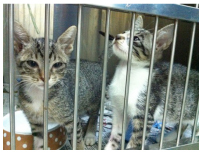 Ninja and his siblings were found abandoned in an NTUC type basket. One of his brothers died from wounds that looked like rat-bites. Ninja got lucky and survived. If you open your heart and home to this little fella and love him for the rest of his life, he might just be the luckiest kitty ever. Panther is an orphan kitten whose mother was crushed dead on the road. He has a little nerve disfunction which has resulted in him trembling a little when he walks or stands. The vet suspects it may have been from a flu he caught earlier. He is eating well and is a little bundle of happiness. His nerve disfunction has not affected his capacity to love or want to be loved. Can you give him that? And because our black cats lurve their friends, here are some black and white cats looking for homes too! Remarkable one-eyed Ted is the best looking little pirate ever. He has limited vision because he had a badly infected eye that could not be saved, but you never did see a sweeter cat than Mr Ted. Little Bear the kitten, an easygoing little fella who was found abandoned in the void deck in a box and barely enough kibble to keep him going for long. He’s come a long way from being terrified, and is now a well-behaved, chilled out cat. In the curious case of Tom, he looks like a completely black cat till he turns over and wa-la!! He looks like he’s wearing a white bikini. How perfectly embarrassing for him, if he knew..But how perfectly entertaining and endearing for the lucky person who gets to share their life with him. The last two adoption “Better with a cat” drives for the year!!! Have you brought some extra lurve into your life in the form of a feline companion? Not yet?! Hrmph. It’s our last two adoption drives at the Pet Safaris at nex and vivo. Come visit us and the cats looking for homes to call their own! Visit the RP students as they support CWS with their social enterprise booth. Join various animal welfare groups at Expo to learn about responsible pet ownership. There will be cats up for adoption, merchandise and activities for kids. Bring your friends and family and make it an educational weekend! The second roadshow will be held on 17 November – here’s your chance to come register as a cat owner and learn more about the programme. Volunteers will be on hand to answer your questions. The flea markets will be on from 24-25 November with merchandise galore. Feel free to swing by and buy some stuff to support CWS. It’s a carnival all round and there’ll be a bird singing contest. I’ve never been to one..have you? Vintage + cat adoptions at one of the newest malls in town. More explanation required? We think not. There’s a food donation and drive being held by the good people at PLC. And they’ve opened the space to an adoption drive as well! More kitties getting a home! Yay! We found a fantastic website where two rescued cats are making sure their minion runs a website with daily humour and raises money for other kitties like themselves in shelters!! Our hearts melted.